This is probably the least interesting section of the GR 221. 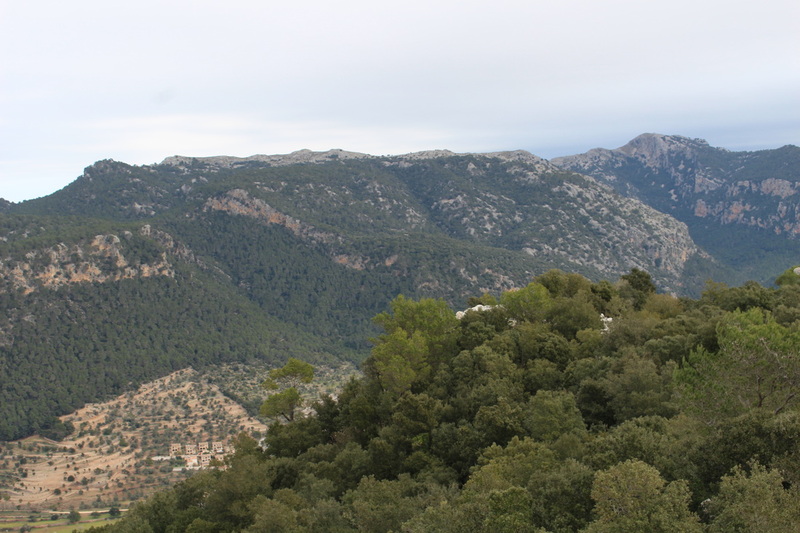 The views along the way are quite pretty but certainly not fantastic and a large part of the walk takes place in a fairly dense oak forest, where there are no views. There was also a right of way issue on the section between the Col de Sa Basseta and the Col de San Jordi. that seems to be in limbo. Hikers have reopened and re-cairned the GR 221 route so there is no navigation issue; a few bits of walling and fencing as well as some no entry signs remain, that are ignored by all. The municipalities have however yet to redeploy the proper GR 221 markers along this section. 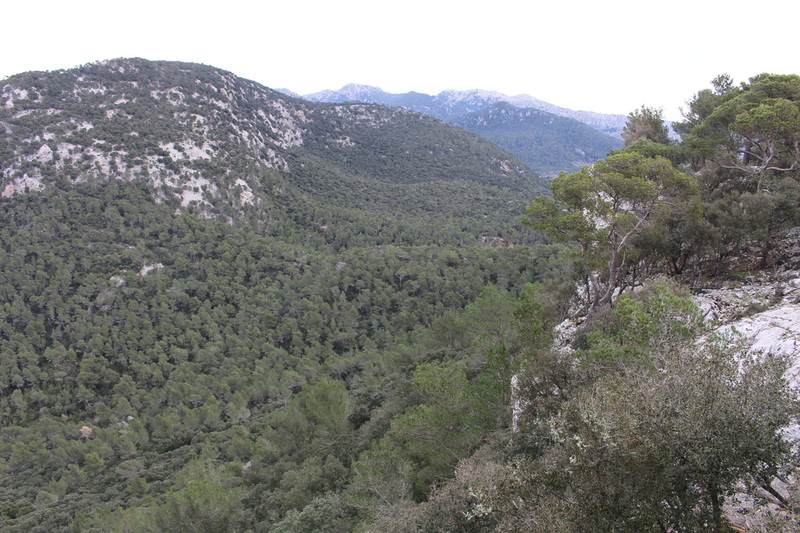 In any case, if you are hiking the whole GR 221, you would be far better advised to take the very pretty coastal trails to Valdemossa from Banyalbufar via Port de Canonges. 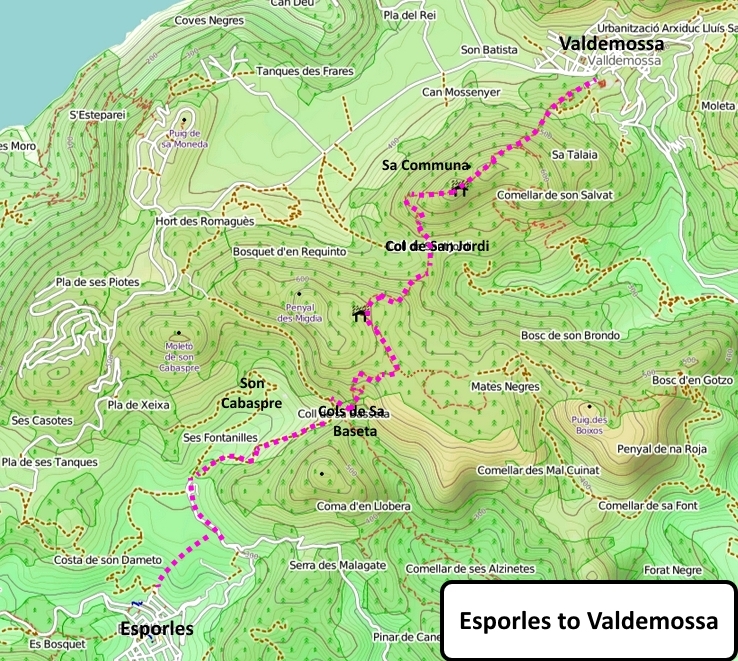 If time is short, two short bus hops (one from Esporles to S'Esgleieta on service 200 and one from S'Esgleieta to Valdemossa on service 210) will get you to Valdemossa in no time allowing you to spend the day in the beautiful Teix range and on the Cami de S'Archiduc, reaching Deia or even Soller for the night. For the die hard twotwooneers, her goes. This is a one way walk, so public transport is probably best. Service 200 ill bring you to Esporles from Palma in about 30 minutes, while service 210 links Valdemossa to Palma (and Deia & Soller) also in half an hour. Buses to Valdemossa can be very full. Those driving can rejoin there cars using these two bus services after completing the walk. From the top of the main square in Esporles (Placa d'Espanya) take Carrer Nou de San Pere, cross the little river and follow on on the Carrer Mateu Font. You will soon reach an other bridge where a GR221 signpost will conveniently guide you to the left and up. The way follows a small gully , climbing steadily. You will rejoin the asphalt about 15 minutes later; take a left and follow the road all the way through the gates of son Cabaspre, where you take a right on a tarmacked road in poor condition going steadily up hill. Follow this for about half an hour, till the road turns to the left and levels out. A turnoff on a dirt track to the right will lead you up to the Col de Sa Basseta in a few minutes, where the cairned path starts across the forest. After a few fairly steep climbs you will reach a boundary wall where the GR wass closed off by the landowners. Follow the cairns and paint marks around this, and keep on through the forest till you reach more level ground and a more distinct trail. The area is full of ancient charcoal platforms. This will take you to a large dirt track, which you take to the left and follow almost to its end, where the cairn line will take you on a large sweeping curve northwards. You will get some views from here, looking west from atop a small set of cliffs. 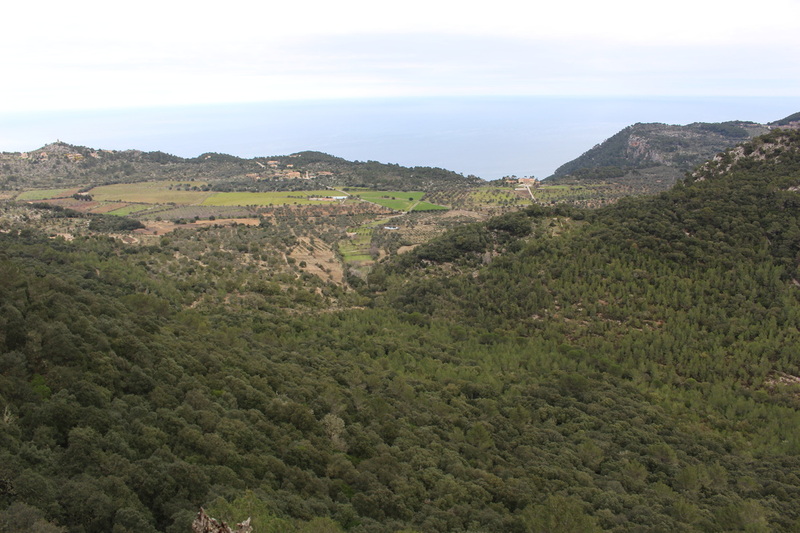 The cairned trail continues, this time down hill through a small gully and down to the Col de San Jordi. At the col, go through the gate in the boundary wall and take the path following the same wall northwards, up hill on its western side. This is actually a nice ancient stone path, that will take you all the way to the summit of Sa Comuna hill, some 300 meters higher, right above Valdemossa. Keep straight on downhill on the other side of the mountain to ender Valdemossa from the village south west. Deia is 4 to 5 hrs away, Hotel El Encinar only 3 hrs away via the Col de Son Gallard .